A new video from Fluid Components International (FCI) illustrates the VeriCal In-Situ Calibration System for the ST100 Series Flow Meter, which enables periodic field validation and verification of a flow meter’s measuring performance without extracting the meter from the pipe or process. The easily installed Verical in-situ calibration solution can validate performance on-site in minutes and assist with compliance with ISO and local regulations. With the VeriCal In-Situ Calibration System, validating flow meter calibration is no longer labour intensive, costly or challenging. The system allows for the verification of flow meter calibration in minutes without removing the meter from the pipe or process and makes it easy to meet process validation more effectively and comply with environmental regulation requirements. In the past, flow meters had to endure the cost and hassle of being pulled from the process, then returned to the manufacturer or a calibration lab for testing and then shipped back for re-installation. The VeriCal In-Situ Calibration System is available for the revolutionary ST100 Series Flow Meter, which sets a new industry benchmark in process and plant air/gas flow measurement instrumentation, offering the most feature-rich and function-rich electronics available today. The leading-edge ST100’s superior flow sensing performance delivers unsurpassed adaptability and value to meet plant gas flow measurement applications for today and tomorrow. Beyond continuously measuring, displaying and transmitting the industry’s most extensive array of parameters, the ST100 is the first thermal mass flow meter with a migration path to tomorrow. Whether the need is for 4-20 mA analogue, frequency/pulse, alarm relays or digital bus communications such as HART, Fieldbus, Profibus or Modbus, the ST100 is the solution. 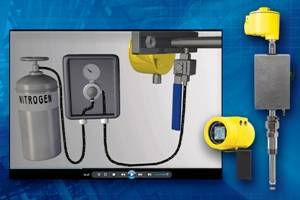 Should a plant’s needs change over time or an upgrade be desirable, the ST100 Flow Meter adapts as necessary with a plug-in card replacement that can be changed out by plant technicians in the field. That takes “never obsolete” to a whole new level in flow measurement instrumentation. The ST100 is the first thermal flow meter to offer three different types of flow sensors to best match user applications. The fast-response FPC-style is a fast response features an integral flow conditioner and protective shroud optimized for compressed air and clean gas applications. For wet or dirty gases, or erratic flows, the unshrouded S-style facilitates easy cleaning and provides a smoothed response. The fast-response, general purpose FP-style features a protective shroud and is the sensor used with FCI’s VeriCal in-situ calibration option. Designed for rugged industrial processes and plants, ST100 Flow Meters include service up to 850ºF (454ºC) and are available with both integral and remote 300 meters electronics versions. The ST100 is agency approved for hazardous environments, including the entire instrument, the transmitter and the rugged, NEMA 4X/IP67 rated enclosure. Instrument approvals (submitted and pending) include: FM and FMc: Class 1, Division 1, hazardous locations, Groups B, C, D, E, F, G; ATEX and IECEx: Zone 1, II 2 GD Ex d IIC T4.